ABC—Celebrating 65 Years of Excellence! The Vista® CTO4 is a four-post version of Aspen's award winning Vista CTO. Designed for maximum comfort, support, and adjustability, the Vista CTO4 provides therapeutic motion restriction in all three planes of motion. Multiple adjustment points allow the orthotist to effectively fit various anatomies. The Vista CTO4 utilizes the new Vista MultiPost™ Cervical Collar with pivoting occipital panels that are designed to reduce pressure points. Supporting the progression of care, the Vista CTO4 easily steps down to the Vista CTO and Vista MultiPost Collar as the patient's condition improves. SPS is excited to offer the new Alpha® SmartTemp™ Liner from WillowWood. The SmartTemp Liner brings temperature control to prosthetic liners for the first time with Outlast®, the original heat-management technology developed for NASA. Now amputees have a viable solution for a comfortable prosthetic liner that works to delay the onset of sweat, and the amount of moisture within a liner. Available in transtibial and transfemoral applications in progressive and symmetrical AK profiles, the Alpha SmartTemp Liner uses one-way stretch Select fabric that controls pistoning yet allows for easy donning. Until now, all advanced vacuum systems have required a sleeve to maintain vacuum. The problem is that sleeves are bulky; they bunch behind the knee, restricting range of motion. They can also puncture, leading to a loss of vacuum. Enter Unity™. Building on established Seal-In® technology, the Unity Sleeveless Vacuum system by Össur® is the first advanced vacuum solution to generate 15-22 in Hg of vacuum without a sleeve. 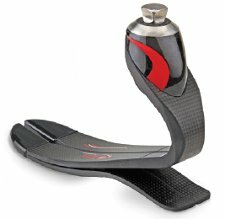 Visit www.ossur.com/unity to learn how to get certified and check out the entire line of Unity-compatible Flex-Foot feet including low-profile and microprocessor solutions. Choose the smart alternative for post-op transtibial rigid dressings. Limbguard™ offers volume management and incision protection that works-for your patient, for the rehabilitation team, and for your budget. Preserves knee range of motion. Has a new, flared proximal edge to avoid posterior thigh pressure. 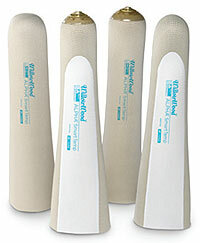 Includes Limbsock™ to ease donning and enhance comfort. Low inventory—fits both left and right with only four sizes. Add your logo and improve patient retention. Make the right first impression. 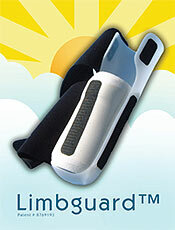 Choose Limbguard — available from Friddle's, SPS, Cascade, and PEL. NUPOC's 21-month MPO program allows you to complete your first two quarters (6 months) and final quarter (3 months) online, plus four quarters (12 months) of supervised practicum on campus, where you practice P&O skills with individuals who live with neuromusculoskeletal impairments. NUPOC graduates are eligible for NCOPE residencies and P&O certification examinations. The NUPOC MPO prepares students to become proficient, compassionate clinicians; assess, prescribe, and deliver comprehensive P&O services; apply research to clinical practice; and contribute meaningfully to the P&O profession. Apply today! From the occasional jogger to the avid marathon runner, the bladeXT assists users in meeting their fitness routine requirements. This cross-trainer-style foot allows users to quickly transition from cardio to weight training without sacrificing safety, stability, or performance. With an overmolded sole cover for improved traction and durability on all terrain, along with a heel wedge that can be added to stiffen heel action, this foot allows for the versatility that cross-training requires. TAD products are designed for people with upper-limb amputation, partial hand amputation, or hand dysfunction. 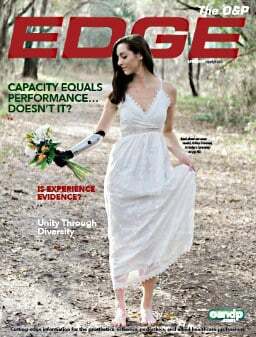 The TAD system temporarily replaces the hook or prosthetic hand on body-powered or electronic UE prostheses. The system can also work with a WHO brace to which a quick disconnect coupler is attached in the palm area of the brace. TAD's quick insert-release terminal device can hold a wide selection of interchangeable tools and implements including dining or cooking utensils; personal grooming devices; and tools for gardening, carpentry, mechanic work, sports, and hobbies. A leading O&P provider recently discovered, tested, and approved FungaSoap® as a specialty cleanser for skin and prosthetic liners. Summer heat and humidity cause even more irritation, rashes, blotches, welts, redness, and itching. Infused with tea tree oil, FungaSoap washes fungus and bacteria away from skin surfaces, gently and naturally-without harsh chemicals-to help soothe and relieve these and other skin conditions. FungaSoap is available at wholesale prices from SPS, Cascade, PEL, or patient-direct. Call to order or for a free trial sample. All stainless steel construction for stronger, longer-lasting control. Lightweight—weighs only 1.5 oz. per hinge. Sold in pairs, with an ultrasmall joint head to reduce overall bulk. Taller, reversible, stainless steel upright helps to corrugate the plastic strut, reducing the need for thicker plastics. AFOs can be fabricated with plastic as thin as 3/32 in. Adjustable stops allow movement from 0-30 degrees in both directions or anywhere in between. 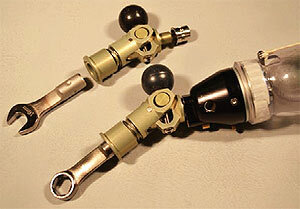 Contourable distal stirrup attachment increases strength connection of the molded footplate and allows for thinner plastic in AFO fabrication. The new version of our Summit Lock, the Proximal Lock, mounts the same way, but with an easier-to-use, flexible, silicone adhesive. The Proximal Lock glues to most fabric-backed liners with no problem, and locks into the socket with nothing needed on the distal end; use the adaptor of your choice to maximize clearance. 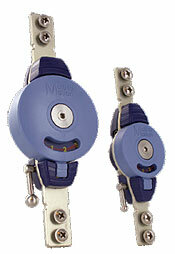 The Proximal Lock controls rotation and offers suspension and security. Ideal for long limbs with minimal clearance. Flexible attachment rolls on easier. Can be used with liners with a seal band. The Freedom Agilix™ is a multiaxial, shock-absorbing, flexible foot system designed to manage loading impacts, reduce socket shear forces, and improve comfort while walking on nearly any terrain. The ultra-lightweight design offers low-impact K3 ambulators shockingly comfortable performance at a value like no other. Learn more about the Agilix on our website. Richie Braces Now at Hersco! 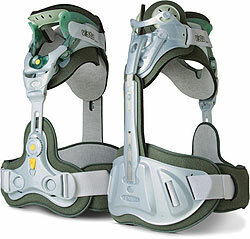 Hersco Ortho Labs is now a Richie Brace® partner lab! Podiatrists often insist on dispensing the original Richie for cases of PTTD, ankle instability, arthritis, and more. For faster turnaround on your Richie orders, send casts directly to Hersco. Download prescription forms at www.hersco.com. Click on our Education tab for great tips and casting methods. Certified pedorthists are available to answer any prescription questions you may have. The AMP CAM Attachment Kit. The game changer! Ask about our evaluation program! The BTK AMP CAM Kit allows the highest tuning of tendon response within further progression of knee flexion. While the ORION already offers users the stability and confidence to perform daily routines, we have added new features to benefit users even more. From fixed angle flexion lock to an enhanced yield rate, the ORION has been readapted to not only fit the needs of everyday life, but also to give the user opportunities to participate in more activities. Our new ORION software allows the knee to be programmed and customized via computer to each individual's walking patterns. The slim and robust 7E9 Monocentric Hydraulic Hip Joint is currently the only hip design approved for a body weight of up to 275 lb. The 7E9 is also the only hydraulic swing and stance hip approved for use with mechanical knees (3R60 and 3R106) as well as the C-Leg and Genium microprocessor legs. The flexibility of these component combinations ensures high functionality, safety, and improved mobility for those with hip disarticulation or hemipelvectomy amputations. Dr. 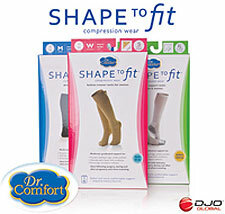 Comfort's Shape To Fit socks and compression hosiery line combines function, fashion, and comfort for preventive, medically correct support that's attractive too. Features include an easy-on graduated compression and Shape To Fit's signature nonbinding comfort band, which provides superior, nonslip support. Uniquely designed seamless socks and smooth-seam hosiery with fresh-weave odor control make them an ideal choice for people with diabetes and foot health considerations. New for 2014! 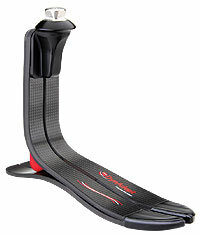 Our latest K2 foot provides a good range of motion and high weight limit in a lightweight and affordable product. 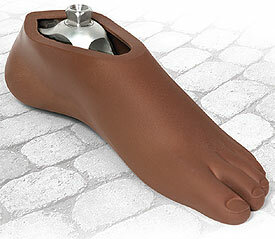 This service-free design also has a full-length toe lever for excellent stability and performance. The Freedom DynAdapt™ foot is a slim-profile, carbon-fiber foot system with a slender, anatomic design for easy fit and finish. 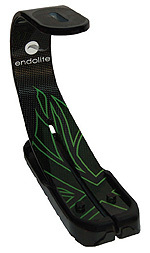 Its multiaxial function provides maximum comfort and the uninterrupted strands of carbon fiber in the full-length heel provide patients with effortless rollover and a more natural gait. The new EnduraCore™ Technology composite laminate delivers up to three times the fatigue life of a standard laminate in a design that also returns more energy. The result is a highly durable product that preserves users' energy so they can do more with confidence. Extreme protection for extremely active people with amputations. When used with compatible feet and components, Aqualeg covers allow amputees to wear just one prosthesis for every activity, regardless of the activity. 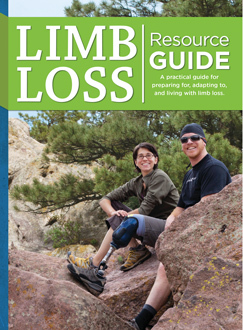 An amputee can finally enjoy extreme activities without damaging his or her prosthesis. 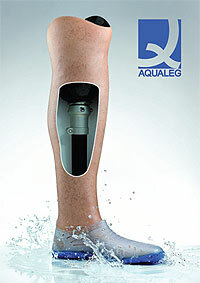 Aqualeg covers are exceptionally durable and resistant to punctures, cuts, and tears, and are heat resistant. They even come with a full one-year warranty-if a customer damages the cover during the first year, we will replace it. Contact us today for more information. The Stride4™ Shadow is a lightweight KAFO that combines structural strength and cosmetic appeal with the new Stride4 mechanical stance control orthotic knee joint from Becker Orthopedic. 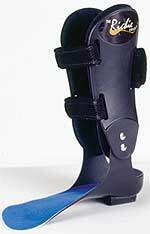 Three operation modes: stance control, free motion, and locked with stance phase knee flexion. Four-bar linkage mechanism to afford stability and mimic anatomical knee motion. The inherent rigidity of the Stride4 Shadow ensures that optimal joint alignment and function is maintained throughout the gait cycle. A new feature will soon be available for Motion Control terminal devices (MC ETD and MC Hand ProPlus versions). Force Limiting stops grasp force at approximately 2 lb., allowing grasping of delicate objects and reducing the fear of injuring someone by over-gripping. Each "pulse" increases the gripping force by approximately 2 lb. Auto Grasp detects a socket or electrode slip and automatically increases grip force. Suggested L-Codes: L-6881, L-6882, L-7009, and L7499. Universal sizing, optimal comfort, and conformance to individual shapes are all possible with the SLEEQ® series of spinal bracing solutions. Designed to be tailor-fit by a trained professional, the SLEEQ line of products provides comfort and support for pain management and operative treatment. InvisAdjust™ technology provides a near-universal fit in one model, freeing up inventory dollars. The TruGlide™ tightening system's easy adjustment achieves optimal compression for effective pain relief. Q-Lex™ OrthoSport materials promote air flow that keeps patients cool and dry. AeroFlex™ support system for low-profile, ventilated comfort that automatically conforms to the patient. 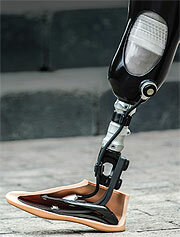 Find out why CPs and amputees are raving about this new, low-profile prosthetic foot. Our Flexeon™ fiberglass composite material is two times more flexible than carbon fiber and nearly indestructible. This translates into zero dead spots, zero repairs, reduced socket issues, and higher patient satisfaction-all of which are good for your business and your patient. Our unique design ensures the most stable, natural K3 mobility and lifestyle experience for your patients. Try it and see for yourself. Call today and receive a special introductory discount on your first two orders. The Adaptor Kit for the Harmony E2 adapts the VMP-007 for use with the Harmony E2 for perfect compatibility. The new medi 4Seal TFS Liner combines a revolutionary sealing technology with a unique self-gliding surface, providing extraordinary suspension, comfort, and ease of use for those with transfemoral amputations. 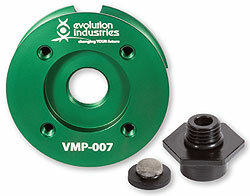 Integrated seals for easy inversion and a highly secure fit. Easy Glide PLUS outer surface-no donning aids or sprays required. Excellent tissue control due to a highly effective, full-length matrix. Optimal radial stretch for greater comfort. Simple to use gel-grip spacer socks for easy application (available separately). The new Modular Ring Lock Knee Joint, model 1402-B, offers innovations like casted holes for optional ball catches (included) that can be easily installed at any time without machining or the use of specialized tools. In addition, the ring lock has been designed to improve grip for patients with poor hand dexterity and to increase rigidity to resist stretching. The 1402-B is also capable of accepting 3/16 in. x 5/8 in. and 1/4 in. x 5/8 in. uprights to help minimize inventory. Lamination uprights are also available for fabrication with composites. As prosthetists, our designers know the importance of a good fit. We also know that different clients have different needs and that there are times when an off-the-shelf TES Belt or Durasleeve will not meet those needs. For those special clients, Syncor Ltd. offers custom-designed TES Belts and Durasleeves. Our complete line can be adapted to meet the needs of clients with transfemoral amputations. We can also custom make the Durasleeve for transtibial suspension, including the Durasleeve HD for exceptionally active clients and the Durasleeve EZ for clients with limited dexterity. For special orders, contact your Syncor supplier. 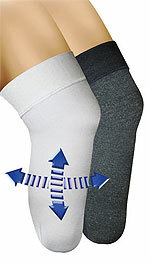 The new Knit-Rite 4-Way Stretch Shrinker features multidirectional stretch for improved fit and comfort. Featuring Knit-Rite's core-spun construction, the 4-Way Stretch Shrinker provides a wider range of stretch, with a silicone dot suspension band to help keep the shrinker in place. 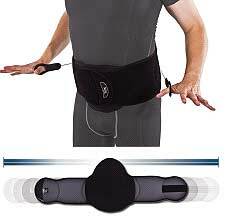 Transfemoral versions with a waist belt are also available. Shrinkers have either medium (20-30 mmHg) or heavy (30-40 mmHg) compression, in transtibial or transfemoral versions. The standard shrinker comes in white; the black shrinker features X-Static® fibers to prevent odors and provide wicking and thermal properties. This dynamic corrective system joint ensures fast, efficient, and effective treatment of contractures resulting from neurological conditions. It is simple and uncomplicated with just two joint sizes to accommodate any extremity joint, and no complicated order forms to complete. Flexion/extension. Just flip the joint housing internal spring based on the anatomical location. Range of motion. Limit at 12 degree increments (small) or 14 degree increments (regular). Force control. Up to 3.4 Nm/30 in.-lb. (small) or 10.2 Nm/90 in.-lb. (regular).